WikiLeaks founder Julian Assange (C) leaves the Westminster Magistrates Court in a police van, after he was arrested in London, Britain, April 11, 2019. Less than a month before Donald Trump was elected as the U.S. president in 2016, he said, "WikiLeaks, I love WikiLeaks," as the anti-secrecy group released another cache of emails hacked by Russian operatives from the computers of Democratic officials that were damaging to Trump's opponent, Hillary Clinton. "Boy, I love reading those WikiLeaks," Trump said four days before the election. 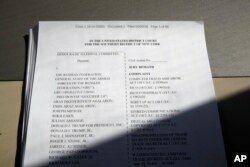 FILE - A lawsuit that was filed by the Democratic National Committee is photographed on April 20, 2018, in Washington. The national Democratic Party sued President Donald Trump's campaign, his son, his son-in-law, the Russian Federation, and WikiLeaks, accusing them of an intricate conspiracy to undercut Democrats in the 2016 election by stealing tens of thousands of emails and documents. But on Thursday, the Justice Department that is part of Trump's administration accused WikiLeaks founder Julian Assange of conspiring in 2010 with former U.S. Army intelligence analyst Chelsea Manning to disclose hundreds of thousands of confidential military records from the U.S. wars in Afghanistan and Iraq and 250,000 secret State Department cables. Assange started WikiLeaks in 2006, but his first worldwide notoriety occurred four years later, with the release of the first documents Manning stole from U.S. government computers, with what U.S. prosecutors say was Assange's help to Manning to crack a password and gain access to the files. Some of the video footage WikiLeaks released captured the world's attention, showing U.S. soldiers killing 18 Iraqi civilians from a helicopter. FILE - Wikileaks founder Julian Assange, left, leaves Britain's Royal Courts of Justice after his extradition appeal was heard in central London, July 13, 2011. 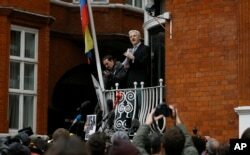 Wikileaks founder Julian Assange speaks on the balcony of the Ecuadorean Embassy in London, Feb. 5, 2016. Ecuador also grew weary of Assange's behavior at the diplomatic mission and his role in the disclosures of more documents, especially insider files from the Vatican released earlier this year, and granted British authorities the right to enter its compound on Thursday after he had spent nearly seven years there. Plainclothes officers grabbed Assange as he shouted in protest, "UK must resist!" and hustled him into a waiting police van. In parliament, to a round of cheers, British Prime Minister Theresa May said of Assange's arrest, "No one is above the law." Assange's lawyers say he will fight extradition to the U.S.
Assange's U.S.-based attorney, Barry Pollack, criticized the Justice Department charges, saying they were "an unprecedented effort by the United States seeking to extradite a foreign journalist to face criminal charges for publishing truthful information."